See Central heating header tank. “Wholly residential property of less than 5 storeys containing HACC is exempt from examination by a qualified consulting engineer and properties confirming with the following conditions may be deemed to be safe. The buildings do not consist of more than four storeys. In the case of roofs of HACC construction (1) they are of joist and block composite construction, (2) they are not used for access, except for maintenance, (3) the spans do not exceed 6.5m clear (21”4”) in the case of standard joists having a depth of 7” or less (x7) and 8.5m clear (27.10”) in the case of similar beams having depths of 9” or 10” (x9 and x10). There is not persistent leakage or sustained heavy condensation. Buildings which do not comply with these conditions should have the HACC examined by a suitably qualified consulting engineer and if it receives his approval may also be regarded as in safe structural condition”. When inspecting properties built or altered between 1950 and 1974 and containing pre-cast concrete elements, valuers should make sure that the building satisfies the criteria for exemption. If in doubt, or if the building does request the vendor or his agent to provide evidence that the building does not contain HACC, or that if it does a structural engineer has inspected it and found it to be satisfactory. A shaped galvanised or wrought iron strap. Fixed at the base of the hip rafter and provided to prevent the hip tiles slipping down the hip rafter. Plaster which absorbs moisture from the atmosphere. When a wall has suffered from rising dame this caused plaster to become hygroscopic. One hygroscopic, even if wall is effectively treated against rising dampness, plaster will invariably remain damp due to atmospheric moisture. Therefore, it is usual when damp proofing treatment is undertaken that replastering to approximately 1.33m is carried out using a waterproofed plaster. A sheet material usually of low density. Provided to give thermal insulation to a flat roof. Laid on the roof joists before the roof decking to form what is called a warm roof. A steel strap or stirrup. Provided to support the end of a joist by being either built into a wall or fixed to a trimmer joist. The bonding of a new wall to an existing wall. If brickwork to brickwork then bonding usually every three alternate courses. If brickwork to blockwork usually three courses of brickwork for one course of blockwork. Downward movement of sloping ground resulting from the action of self weight stressed and imposed loadings exceeding the available strength of the ground. Landslip may be triggered by the application of superimposed loadings from buildings or may be induced by excavating into sloping ground with the result that material fails and moves down the slope. A roof covered by lead sheets.Very durable but expensive roofing. Weak points tend to be rolls, drips and edges. A chamber constructed to give access to a drain or sewer.Usually constructed of brick or pre-cast concrete rings. Shallow manholes may be prefabricated in earthenware or plastic (Compare Inspection chamber). A removable access plate over a manhole.Generally of cast iron but lightweight covers of galvanised steel now in common usage but only where likely to be cross by lightweight traffic. Usually designed to be air tight. Should be replaced if broken. Vegetation growth indicative of damp usually on surface of wall or roof covering. Where on walls source of dampness should be investigated and necessary repairs carried out. However, dampness may have saturated wall and structural timbers internally opposite. 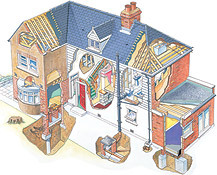 On roof coverings it may have grown up and under coverings and may cause dampness in roof timbers. In either case this may lead to fungal decay of affected timber. A member that divides a door window vertically into lights. Not to be confused with glazing bars which divide lights into panes and can be vertical or horizontal. (Compare transoms). A small top hung light in a casement window. Provided to give low level natural ventilation, particularly in bedrooms when they are occupied.